This cake is a little fiddly with a few different steps and processes, but I think it’s worth it. 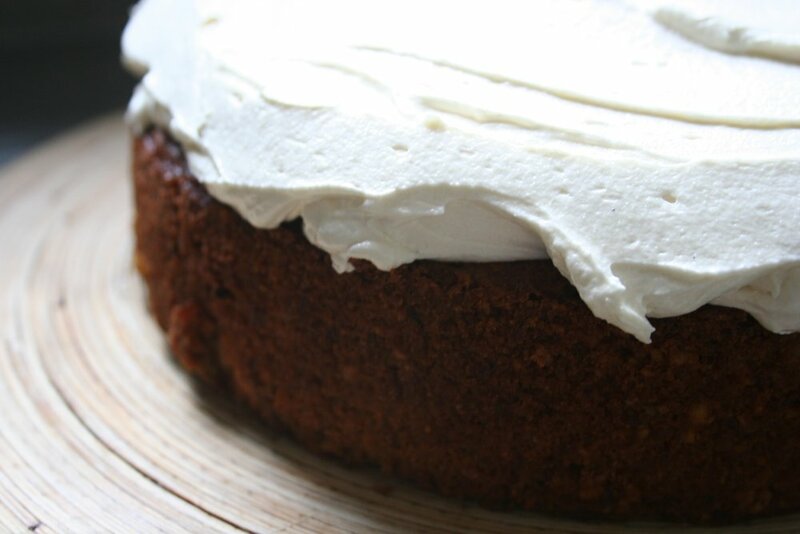 It’s still a fairly classic carrot cake, but the hazelnuts, brown sugar and tahini give it a lovely dark and nutty-caramel flavour. It isn’t a spongy light cake, as it's made partially with hazelnut meal, but I love the dense rich texture. It will last for a good few days in the fridge in an airtight container but make sure you let it come up to room temperature (2-3 hours) before you eat it, or the cake itself, and icing especially, will be rock hard and lose some of its flavour. I'm taking this to a friends for morning tea as a house warming gift, which I also get to eat. It's a win win situation. Preheat your oven to 180 Celsius and line a medium sized round tin with baking paper. In a large bowl cream the butter and sugars together until the mix is pale and fluffy. Then separate the eggs (leaving the whites in a large stainless steel bowl until later). Add egg yolks to the creamed butter and sugar (in two batches) and beat until well combined. In a separate large bowl mix flour, salt, baking powder and spices and set aside. Next, in a food processor, give the hazelnuts a quick blitz (so they’re still quite chunky) and take half of them out and tip into the flour mix. Blitz the rest of the hazelnuts into a meal. Make sure you don’t over-blitz them into a paste. Tip the hazelnut meal into the flour mix and stir through. Then peel and grate the carrots and add to the flour mix. Zest and juice the orange and also add to the flour mix. Finally fold through the creamed butter and sugar until it's well combined. The mix will be quite stiff at this point which is fine as we still need to add the egg whites. Finally, beat the egg whites until they form soft peaks and fold gently through the cake batter in two batches. Tip into your tin and bake for 50-60 minutes. I covered the cake in foil for the last 15 minutes of cooking as it got a little bit dark. Once the cake is done and a knife comes out clean from the middle, leave it cool in the tin for 15 minutes or so and then turn out and cool completely on a wire rack. While the cake is cooling, make the icing. Beat butter, vanilla and tahini with a hand beater for 2-3 minutes until it’s really light and fluffy. Fold through the icing sugar one cup at a time, and then add only as much milk as you need to get the right consistency. Although I know using quality ingredients is a given in any aspect of cooking, using the best possible hazelnuts you can find really makes a difference in this cake. I'm lucky enough to have freshly roasted hazelnuts at the Farmer's Market where we have our donut stall, and they taste incredible. It's well worth searching around for some.